Anyone has experience with springs from BHSpring Solutions? I want to get some feedback before I install them. I have them both. Thanks in advance. First i have heard of them. 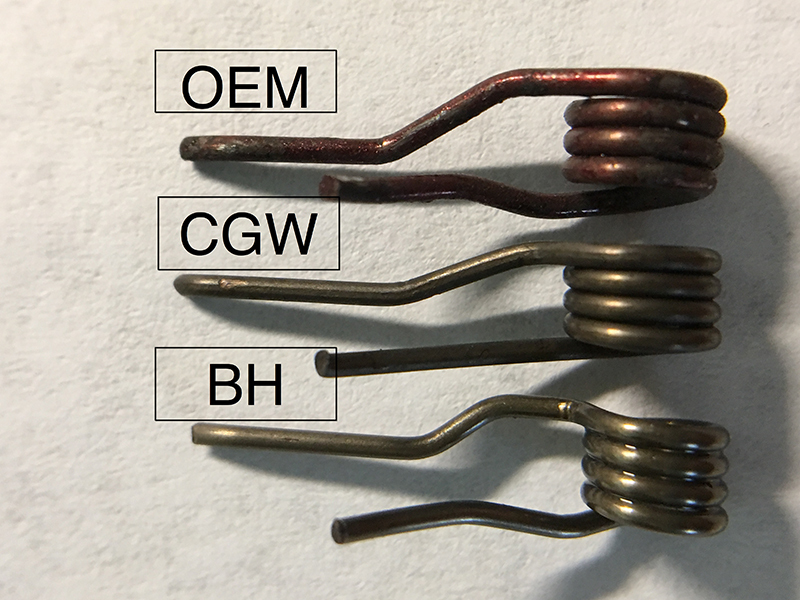 I picked up some springs kits on sale, which include 15# hammer spring, 17# recoil spring, reduced power trigger return spring, fpb spring and firing pin spring. I can't be sure from the photo, I think I'm seeing a major flaw in that spring. It looks like a notch or nick in the spring right at the bend nearest the coils. That's a high stress area on most springs and a likely failure point. I think they have made springs/parts for Browning Hi Powers for a while. First I've heard of them doing CZ parts. They are hawking their spring kits for the Tisas Hi Power clone as a way to preemptively fix early spring failures. I think they’re just creating doubt in people’s minds to sell more of their stuff. They have a lot of BHP after-market springs, kits and grips. They are creases created when the spring is bent. The CGW's is straighter; thus the creases are not as noticeable. BH provides lifetime breakage replacement guarantee for the life of the pistol*. I haven't tried their CZ springs but have been very happy with the HP and 1911 springs I've gotten from them. They're a stand up company too. They accidentally sent me the wrong recoil spring once and I had the correct one in my hands the next day. As for the factory Tisas HP springs, they are crap, trust me. Also - if you order from CZ and get the Shadow 2 TRS it is a new model and supposedly more durable. I can tell you its stronger and makes the DA harder a tad.